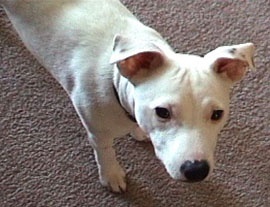 Deaf dogs: Pounce, a one-year-old Jack Russell Terrier. Pounce is a rascal who loves to have fun. He's full of energy and understands ASL. He's still learning new tricks! Amy, a cuddly Australian Shepherd puppy, looks up to Pounce and follows him everywhere. Deaf dog: Droo, a 15+ year-old Pomeranian who is deaf and going progressively blind as she ages; Daisy, a 10-month-old Australian Cattle Dog who was born deaf. Other Pets: dogs and cats! Deaf dog: Dogma, an Australian Shepherd who has passed away. Other pets: Hannah, a Basenji mix. 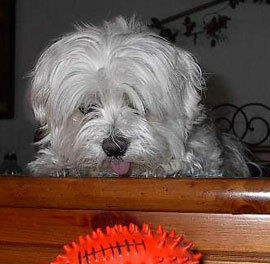 Deaf dog: Tangles (Maltese) is the best dog ever. She knows lots of words and is the most loving thing you ever saw. She had to have an ear ablation, and the infection went to the other ear. As of January, 2003, some of her hearing has come back to the other side,,,,,,, she now has a tumor in her neck that is inoperable. So far, no symtoms, but what's going to happen I don't know. We will spoil her rotten with love and hope she will adjust! Deaf dog: Speck is a 4 year old Rat Terrier He is a therapy dog rescued from a Crack House in Southern California. 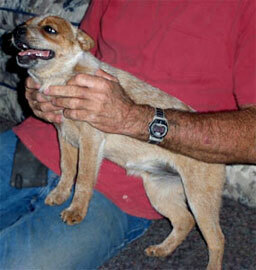 Tug is a 4 month old Australian Cattle Dog. Tug was residing at a foster/rescue home and was at my wife's work to get his shots (my wife works for a vet). She felt so bad for him she called me and asked if I wanted him. Of course I did! The rest is history. He is being trained for Canine Disc a.k.a. Frisbee Dog! 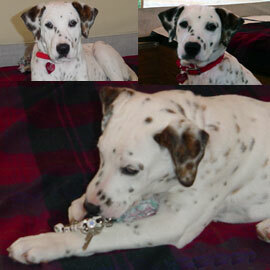 Deaf dog: Libra (Libby) is a 15 month old Dalmatian. She is sweet, smart, fast, friendly, playful! Adopted Libby from shelter; CA law requires all dogs leaving shelter to be spayed/neutered; our vet thought spay clinic used by shelter must have been reusing unsterilized surgical tools repeatedly because when we brought our new pup home she had a huge infected area where the anesthetic was injected; she also had kennel cough, was rib-showing thin and we discovered she was deaf. Multiple vet visits later, she's doing great, and we're glad to have her as part of our family. She's very hi-gear & somewhat aggressive toward our first dog, but she's learning fast. We're training with treats for good behavior and squirt guns and time-outs in the kennel for bad (same as first dog, whom I'd previously taught hand signals). Our kennel is large and she's digging it up regularly, but it's secure and she enters freely. Our first, older dog, has run of our large fenced in back yard while Libby is in the kennel. When we're home, Libby and Max share the yard, which has many nooks and crannies and plenty of room for her to run. We walk both regularly, and she especially likes nearby stable; she appears to have an affinity for horses. Deaf dog: P. Bear is a 3 year old Australian Cattle Dog. She was one of 9 pups born at my house and is one of the sweetest and kindest dogs I've ever owned. She is very mischievious, but never in a negative way. I just love her to pieces. When I do the sign for love you, she knows she is going to get kisses and hugs so she sits in front of me with her face close to me. She is not a title holder or therapy dog, but she is loved and brings happiness to our household. She was born totally white and looked like a baby polar bear, hence her name. She is now a red speckle and beautiful. Still loved a whole bunch and continues to bring happiness to us. Other pets: P. Bear's mom, Elsie; dad, Jessie; 2 sisters, Lillie and Rue; a pot bellied pig, Kernal; and three horses, Two Bits, Breezy and Josie. Deaf dog: Chloe is a 6 year old Dalmatian. She is our second Dalmatian (the first was not hearing impaired). She just loves her "kong" toy and has her very only wading pool. Deaf dog: We found Tundra (Great Dane) Online he was just a few weeks old.We brought him home the day he turned eight weeks. 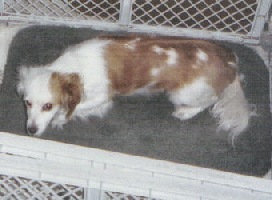 He is white with merle areas and black patches. Blue eyes and a love. Tundra is a member of the family. 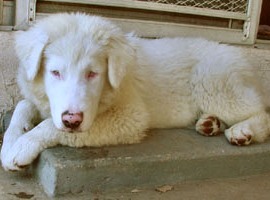 We read a lot and researched the care and training of deaf dogs before we decided to adopt Tundra. He is a fast learner and we have enjoyed his sweet nature with out a single regret. Tundra loves playing with our white big Boxer boy Lucky. They are have a very special bond. All of Tundra's litter mates were girls, all hearing. He was the smallest and born last. He was also the cutest, to us anyway! We use a lot of homemade signs and a lot of love. 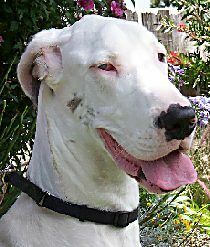 (updated 11/2003) - We now have two deaf Great Danes. Tundra was a eight weeks old pup when we brought him home. Quinn spent his first four years with a young man who got him as a young pup. Both males they get along well. Tundra doesn't know he's a dog so he accepted Quinn into the family. Adding a second deaf Dane to our family was a easy decision. They each have very individual personalities. Tundra is still growing and now weighs 152 lbs. Quinny is more slightly built at 122 lbs. and us a gentle boy. They are both attention hogs and love to sit on our laps or nap beside us. Communication comes easy with simple signs. Other Pets:(updated 11/2003) Tundra deaf Great Dane age 1, Quinn deaf Great Dane age 4 1/2, Hearing Boxers Beau age 4-ish rescue, Lucky age 2-ish rescue, Penny 2-ish, KiKi the cat age 8, Goats Sugar big white goat, Dodger and Willie the Pygmy's...We have two son's, 2 daughters, 3 grand daughters and one grandbaby on the way. Other Pets: Two Korean Jindos and a cat who thinks he is a dog. Deaf dog: We adopted Lilly this week after finding her in our local animal shelter. She had a hold on her and we thought that the people first in line would take her, instead of us getting her. She is a black/liver/lemon Dalmatian. She is a very warm and affectionate pet and is very well behaved. The information they gave us about her said she was a purebred Dalmatian which was found as a stray. It wasn't until we got her home that my mom noticed something different about her. The next morning she told me she thought she was deaf and probably didn't hear at all. My mom told me that lots of Dalmatians are born deaf and she had seen something about them learning ASL to train them. After reading up on the DCA website info it scared me to think of what problems lie ahead. They made is sound as if this is a death sentence, but I am now assured by several people (especially my mom) that although it might take a little longer it shouldn't be a problem training her. She had! her first vet check today at which the vet told us she is totally deaf, but the vet was very ill informed. He couldn't give us any info on what to do or training, except to say that we could call around and ask some of the dog trainers for help. So far at home we have taught her to sit, beg, and housebreak her in this short time. As I said, she is highly intelligent and very well behaved. I can't imagine that whoever had her before didn't go out and try to find her. Comments: Thanks to everyone for all the great websites in finding help for our Lilly! Also to the guy we met at Pet'sMart who told us of his 13 year old deaf Dalmatian! Deaf dog: I adopted Piagi (Austrailian Shepard/Queensland Heeler/Dalmatian/American Staffordshire) from the Animal Shelter when she was 3 months old. She was the ugliest dog in the shelter, but she had a beauty in her soul. 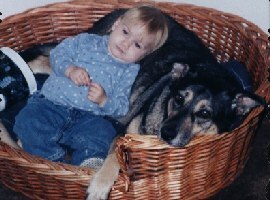 She was my constant companion for 14 years. She enjoyed riding motorcycles, sailing, hiking, car trips, frisbee, Dog Beach and any other dog park. She was my rock and got me through some really hard times. Always there with a smile, a kiss, and as much snuggling as I could stand. She was always there to keep me company in the middle of the night when I could not sleep. She became such a beautiful dog with her blue eyes. We overcame her fear of children, of handicapped people, separation anxiety and food aggression. She nursed a kitten that still needed his mommy when we adopted him. She regularly babysat a baby goat so his mom could take a break. Piagi was a wonderful ambassador for Deaf Dogs. I thought I rescued her, but actually, she rescued me. She is with the angels now and turns out she has always been my Guardian Angel! Deaf dog: Callie is a 16 year old Shepherd/Malamute who is deaf due to old age. "I got Callie by way of abandonment at a groomers at the young age of 10 months. To this day I can't leave her to be groomed. I have to stay with her. The minute I saw her I knew she was mine. She is only special to our family and my baby only. She has been a huge comfort to me all these years. She is a possessive protector of our two grandkids now. Getting old but still a puppy at heart. She is so special that she has been blessed by God with a new pancreas recently, after a bad spider bite 5 years ago. When she goes to the bridge, she will remain in my heart forever." 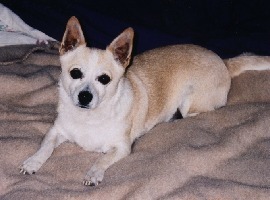 Shortie is a 5 year old Chihuahua/Corgi mix who is deaf due to trauma. "This little guy (9lbs),adopted us! Apparently he was unhappy where he was. He first was running around the neighborhood, then one day I noticed he was staying under our truck parked on the street. After a few days, we found him sleeping on our driveway. The next night he was asleep at our front door. That did it. He had my heart! That was three years ago. Turns out that he was in an abusive situation and decided that my home was better. I was slow to notice that he was deaf, thought he was just stubborn. Callie puts up with Shortie and Shortie is happy now." Human companions: Jan & Rob Rico, Wayne, Shannon, Kristen, and two grandkids. Deaf dog: Buddy McCracken is an approximately 5 year old Lab/Boxer mix. "Buddy was an only child. His family's home burned down 2 years ago and a neighbor stuck him in his back yard with 5 other dogs. He is scarred from the other dogs and came to us with wounds. His ears are full of dried blood, so we assume that he had an untreated ear infection. We now have 2 'only children' and the first gets impatient with him." Other pets: Molly McCracken - female 6 year old rescued dog. Deaf dog: Lambert is a 3 month old double merle Australian Shepherd. 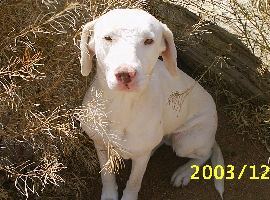 "He is white with a small blue merle spot on his back and bewitching blue almost white eyes. His eyes are also abnormally small and slightly crossed; he has a hard time making out shapes in the sunlight unless they are moving. Everyone says he looks just like a little lamb, and I do mean everyone. We can't go outside without someone saying how much he looks like a sheep (Hence the name Lambert). He is named after a Disney cartoon about a Lion who tries to fit in with the sheep. He definitely fits his name. He is dominant and bossy but still a sweetheart, he likes to play rough and pins our 1-year-old Newfoundland to the ground with his mouth around her neck (All play). His favorite past time is chasing and barking at his shadow... Not kidding!" Other pets: Alorra 1 year old Newfoundland Lab mix... She loves water and puts up with a lot from Lambert! Deaf dog: Vanilla is a 2 year old Pomeranian/Chihuahua mix. " Vanilla is cute and very active. She is very smart. I think she was a runt of the litter." Deaf dog: Zoe is a 2 year old Dalmatian. "While looking at our local animal shelter, we came across a real beauty a Dalmatian but with very few spots, it was love at first sight. We had to wait a week until we could bring her home, so we visited with her every day. She was a little shy at first but as the days went on she would run to the front of her cage when she saw us coming. We have a 2 year old son and she is wonderful around him. She even lets him walk her on the leash. We could not have found a better dog to add to our family. We are looking forward to many happy years with her." Deaf dog: Bleu~ is a "Blue Piebald" Miniature Dachshund with AKC papers. "Bleu will be 2 yrs old on May 25, 2005 I will take her along to Sturgis Rally in South Dakota this aug 2005 to join Deaf Bikers of America. It will be her longest ride. She knows ASL (30 signs more or less). 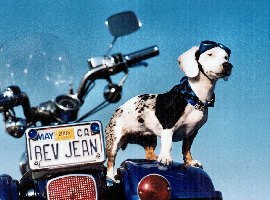 Bleu~ is a true bikerdog natural and rides with me everywhere on my Blue Harley. She wears goggles and a biker jacket. I traveled to Milwaukee for HD 100th bash and decided to ride on old Route 66 to Texas, visited my dad. We went to visit Dachshund farm nearby. I asked for a puppy that has one blue eye as I have, but the breeder didn't have any. She brought one last puppy to me. I fell in love with her. She has bright pale blue eyes. I took her on my harley and rode to Arizona. I stopped and checked if she was alright after 25 miles. She was a very happy puppy with wagging tail! When we arrived in Tucson, my cousin noticed something different about her and immediately said she is hard of hearing. Because she is also hard of hearing herself, she explained that Bleu~ was confused where sounds were coming from. Which directions? Then I studied her more and noticed that she also has a lazy eye. How amazing! She is so much like me. She can't hear at all in right ear. Just like me! I even have a lazy eye in left eye, too. Is it fate or was she meant to be for me? She was in Cops show when we were in Laughlin River Run 2004. She is officially a member of my hog (harley owners group) chapter. She is the perfect dog for me...Harley sounds, Harleys going by.. don't even scare her at all. She is excited to ride. We can enjoy the wind together! She is my biker buddy!" Other pets: 15 year old Bikercat, Sundance.